If you’re in college, chances are you’re overwhelmed by rising tuition and textbook costs. Here’s how you can get a little break with absolutely free development and design software from Microsoft via DreamSpark. Although many students still don’t know of it, DreamSpark has been offering free Microsoft software to students since 2008. 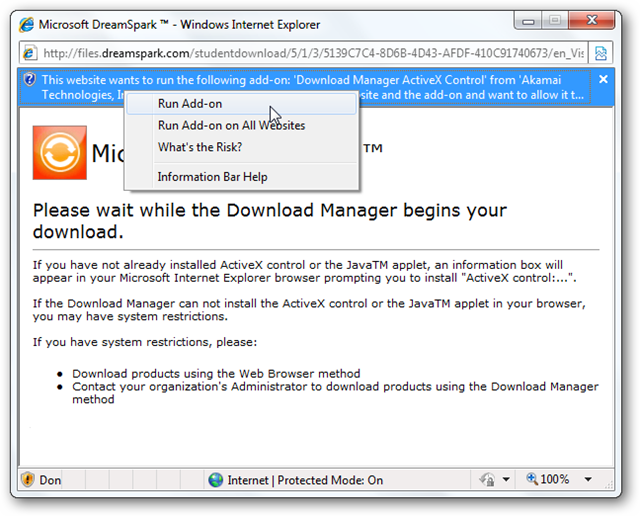 Similar to MSDNAA, students can download and use software for educational and personal use entirely for free, except with DreamSpark, all students are eligible. DreamSpark has recently expanded it’s offerings with training and access to the Windows Mobile Marketplace. Let’s look at how you can take advantage of these offerings if you’re a student. Select a program that interest you for more info about it. 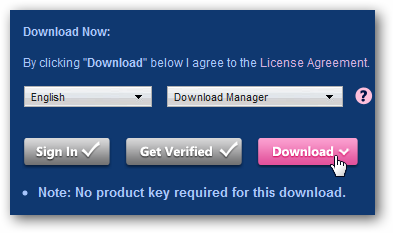 To start downloading software for free, you’ll first have to verify that you’re a current college student. Click Sign In beside the program’s box art to get started. 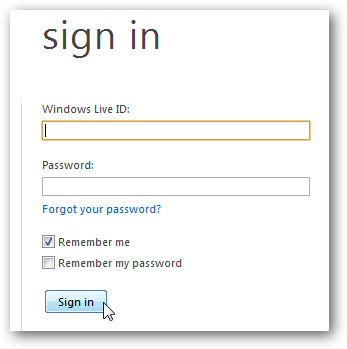 Sign in with your normal Windows Live ID, such as a Hotmail, XBOX Live, or MSN Messenger account. You don’t have to use your college’s @yourcollege.edu email address, as you will enter your college credentials later to verify that you are a student. Once you’re signed in, you’ll be redirected to the program’s page you were on previously. This time, click the Get Verified button. This will open a verification form. Select your country first; DreamSpark is available in most countries around the world, so you’ll most likely be able to find your country no matter where you live. Next, select to verify as a student. Finally, choose how you’d like to activate. The best option for most students would be Get verified through my School, though you can also activate with an ISIC card or an activation code from your school if you’re a high school or home schooled student. Alternately, if you’re an IT administrator at a school, you could register your school or college with DreamSpark so you can give out Activation codes to your students. To do this, select Verify as a School and follow the directions. High Schools and home schooling parents can also register this way, giving their students a head-start with Microsoft’s tools. 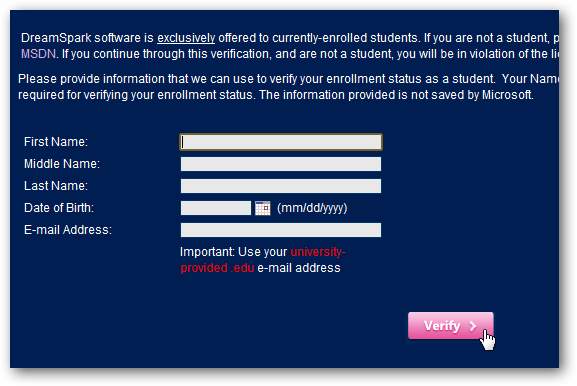 If you selected Get verified through my School as a student, you’ll be directed to a page to select your school. Select your country and state or province, and then choose your school from the list on the right. 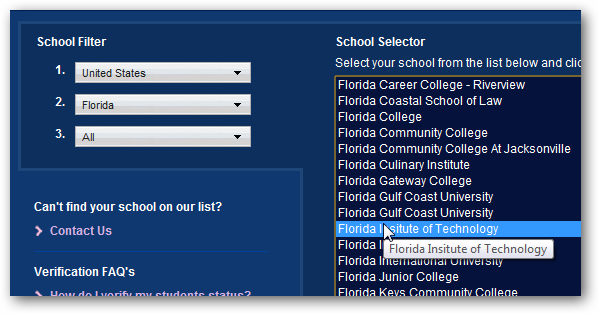 Click Continue at the bottom when you’ve selected your college. Now you’ll be asked to enter your name, date of birth, and college email address. Make sure to enter the @yourschool.edu email address you have from your college. Click Verify when you’re finished. That’s all; now you should be fully verified with DreamSpark and ready to start downloading and using free Microsoft software. 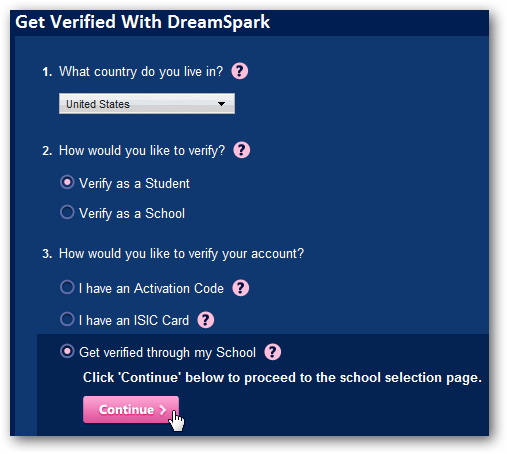 If DreamSpark couldn’t automatically verify your information, you may have to wait a few days for them to contact your college and verify you. Don’t worry, though; if you’re in a standard, accredited college in one of the available countries, you’ll be able to access the software as soon as they verify you. Now that you’re verified, you can download any of the available programs. Select the language you want, and click Download. By default, DreamSpark programs will download with the Akamai Download manager, which runs as an ActiveX Control in IE, or as a Java applet in Firefox, Chrome, and other browsers. This will open the Akamai Download manager, which will let you easily pause and resume downloads to make sure you get the whole file downloaded. Note that many of the downloads are several gigabytes large, so they may take a while to download, depending on your internet connection. Many of the programs are available as ISO disk images, so follow our tutorial on How To Burn an ISO Image to Disk. Alternately, you could Mount the ISO Image and install the software without burning a disk. 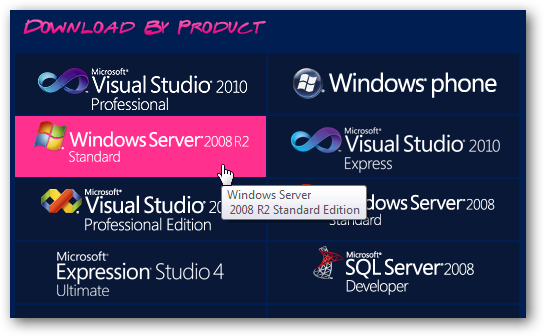 If you’d like to try out Server 2008 R2 but don’t have an extra computer to install it on, try running it in the free VMware Player. No matter what your computer interests, DreamSpark offers programs for design, development, IT, and more. You are not allowed to use these programs to develop or support commercial products, but you can learn them inside and out and develop freeware. Plus, it allows you to submit real, commercial apps to the Windows Phone app store for free, so you can get a head start on making money with Windows Phone 7 as well.